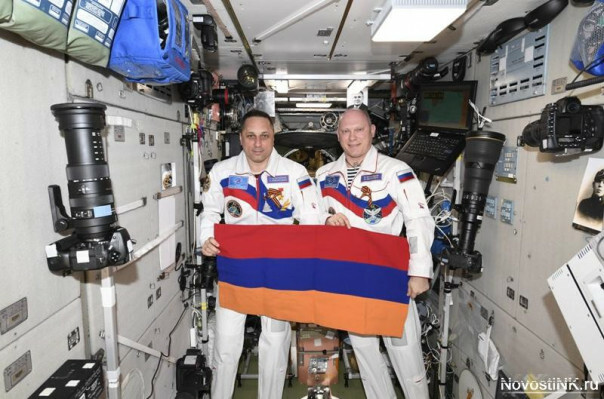 Ahead of the 100th anniversary of the First Republic of Armenia and the 2,800 anniversary of Yerevan, the national flag of Armenia and the flag of Yerevan, Armenia’s capital city have been sent to the International Space Station (ISS). Oleg Mukhin, the vice president of the organization’s South-Western Division, was the first to receive the flags before they were sent to the space voyage. He expressed his support to the initiative, highlighting the Armenian nation’s contribution to space industries. The flags are now on a round the world cruise. The crew is due to return to Earth in September. As early as in October, a Russian delegation including the spacemen is to visit Armenia to attend the jubilee events and to hand over the flags to representatives of the Armenian government and the municipal authorities of Yerevan.